These dippers are our version of the famous Arnott’s “shapes”. The big debate in the office was whether they tasted like the savoury flavour or cheddar – either way they are pretty darn delicious! 1 cup cheddar cheese, grated. and line a baking tray with baking paper. 2. To make the Sweet Carrot Dipping Sauce, coat veggies in olive oil and salt and place in the oven to roast for 30 minutes. 3. Meanwhile, prepare Lunchbox Dippers. Add oats and flaxseeds to a food processor and pulse to form a coarse flour. Add in flour and salt and pulse again to combine. Add in the remaining ingredients plus ⅓ cup water. Pulse until a dough forms. It should come together in a ball. 4. Roll dough as thin as possible on a floured surface. 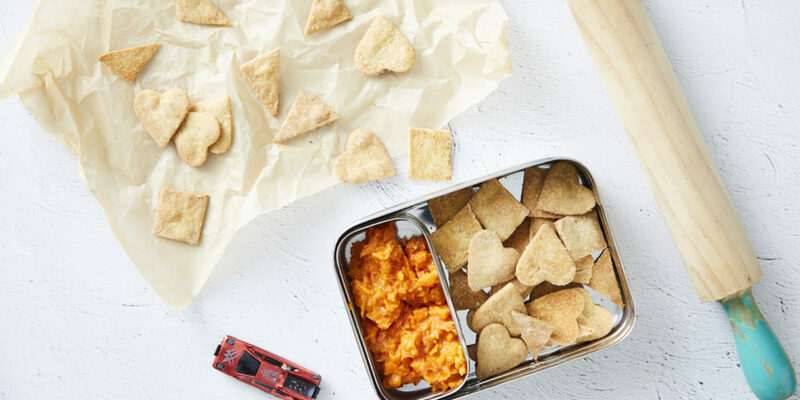 Cut into shapes using a cookie cutter or knife and place on the lined baking tray. 5. Bake in the oven for 20 minutes or until golden. Cool and store in an airtight container for up to a week. 6. Meanwhile, when the veggies are ready, remove from the oven and blend in a food processor. Store in the fridge for up to a week. Dairy-Free Option: Replace Cheddar cheese with ⅓ cup nutritional yeast flakes. TRICKY TIP: Any dip will work with our shapes! Try guacamole, hummus or tzatziki! Or if you’re keen to get in some extra veg, roast some red capsicum instead of tomatoes!